The Baby Burrowing Owl is worked in needle painting also known as thread painting and long and short stitch. This is the most realistic form of surface embroidery which is worked in staggered straight stitches in a single strand of embroidery thread on a closely woven fabric, blending rows of colour to create a very realistic embroidery. The sheen of the threads adds to the soft and life like appearance of the bird. 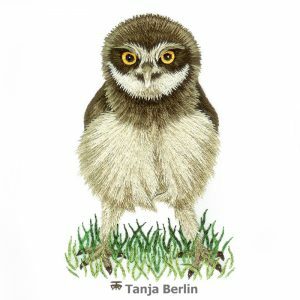 The Baby Burrowing Owl is a beginners design, please visit the Needle Painting Information page for more information on needle painting and rating of the designs from easy to hard. 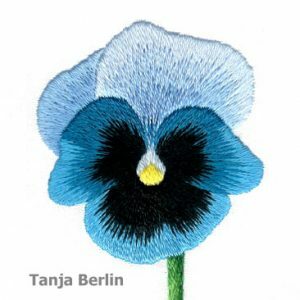 The Bingo Blue Blotch Pansy is worked in needle painting also known as thread painting and long and short stitch. This is the most realistic form of surface embroidery which is worked in staggered straight stitches in a single strand of embroidery thread on a closely woven fabric, blending rows of colour to create a very realistic embroidery. The sheen of the threads adds to the soft effect of the petals. 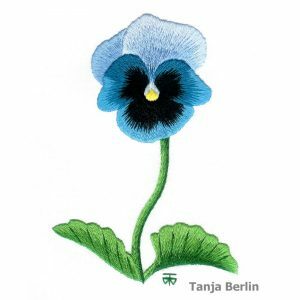 Please visit the Needle Painting Information page for more information on needle painting and rating of the designs from easy to hard. 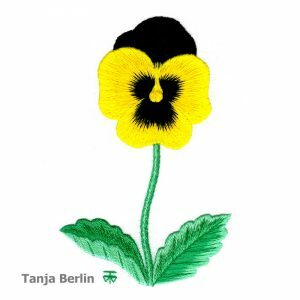 The Bingo Yellow Blotch Pansy is worked in needle painting also known as thread painting and long and short stitch. 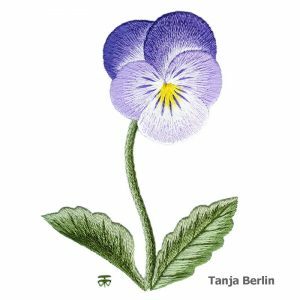 The pansy is a beginners design, please visit the Needle Painting Information page for more information on needle painting and rating of the designs from easy to hard. 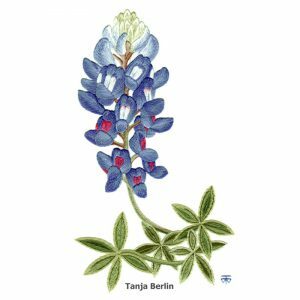 The Blue Bonnet is worked in needle painting also known as thread painting and long and short stitch. This is the most realistic form of surface embroidery which is worked in staggered straight stitches in a single strand of embroidery thread on a closely woven fabric, blending rows of colour to create a very realistic embroidery. The sheen of the threads adds to the soft effect of the petals and leaves. 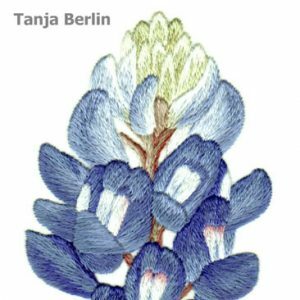 The Blue Bonnet is an advanced design, please visit the Needle Painting Information page for more information on needle painting and rating of the designs from easy to hard. 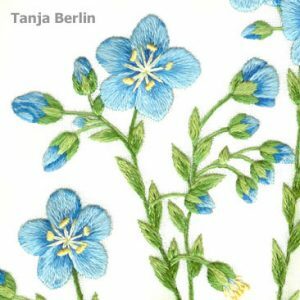 The Blue Flax is worked in needle painting also known as thread painting and long and short stitch. This is the most realistic form of surface embroidery which is worked in staggered straight stitches in a single strand of embroidery thread on a closely woven fabric, blending rows of colour to create a very realistic embroidery. The sheen of the threads adds to the soft effect of the petals and leaves. 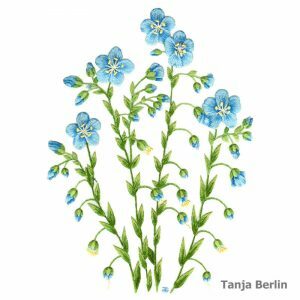 The Blue Flax is a beginners design, please visit the Needle Painting Information page for more information on needle painting and rating of the designs from easy to hard. 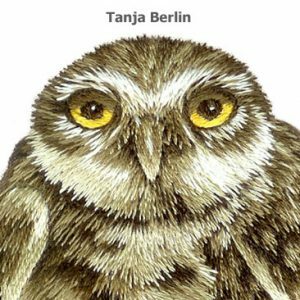 The Burrowing Owl is worked in needle painting also known as thread painting and long and short stitch. This is the most realistic form of surface embroidery which is worked in staggered straight stitches in a single strand of embroidery thread on a closely woven fabric, blending rows of colour to create a very realistic embroidery. 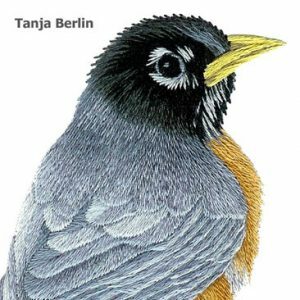 The sheen of the threads adds to the soft and life like appearance of the bird. 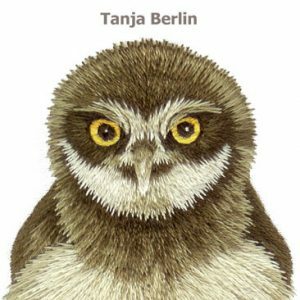 The Burrowing Owl is an intermediate – advanced design, please visit the Needle Painting Information page for more information on needle painting and rating of the designs from easy to hard. 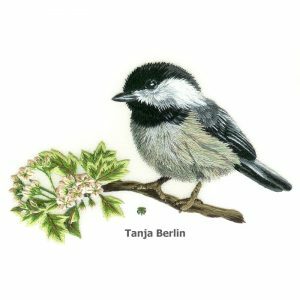 The Chickadee on Blossom Branch is worked in needle painting also known as thread painting and long and short stitch. 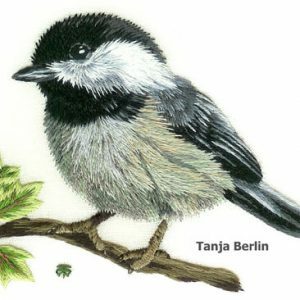 The Chickadee is an advanced design, please visit the Needle Painting Information page for more information on needle painting and rating of the designs from easy to hard. 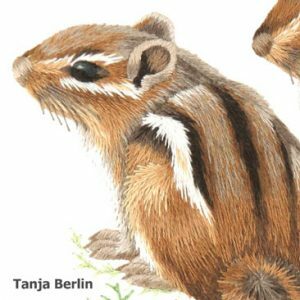 The Chipmunks are worked in needle painting also known as thread painting and long and short stitch. This is the most realistic form of surface embroidery which is worked in staggered straight stitches in a single strand of embroidery thread on a closely woven fabric, blending rows of colour to create a very realistic embroidery. The sheen of the threads adds to the soft and life like appearance of the fur. 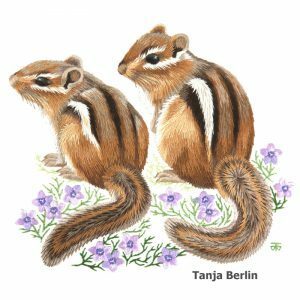 The Chipmunks are an advanced design, please visit the Needle Painting Information page for more information on needle painting and rating of the designs from easy to hard. 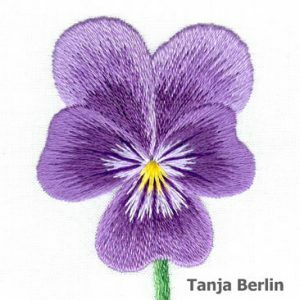 The Clear Purple Pansy is worked in needle painting also known as thread painting and long and short stitch. 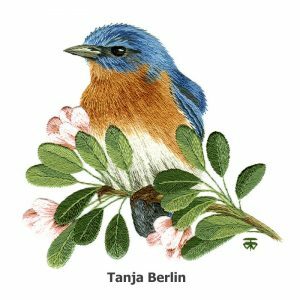 The Eastern Blue Bird on Blossom Branch is worked in needle painting also known as thread painting and long and short stitch. 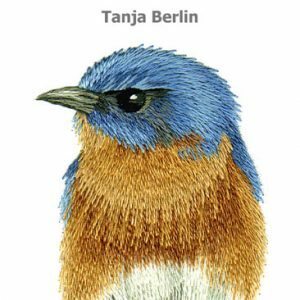 The Eastern Blue Bird is an intermediate design, please visit the Needle Painting Information page for more information on needle painting and rating of the designs from easy to hard. 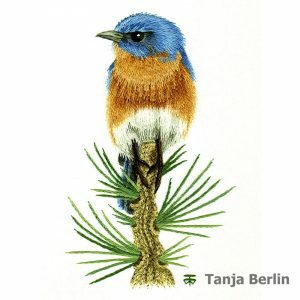 The Eastern Blue Bird on Pine Branch is worked in needle painting also known as thread painting and long and short stitch. 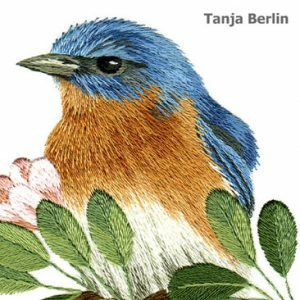 The Eastern Blue Bird is a beginners design, please visit the Needle Painting Information page for more information on needle painting and rating of the designs from easy to hard. 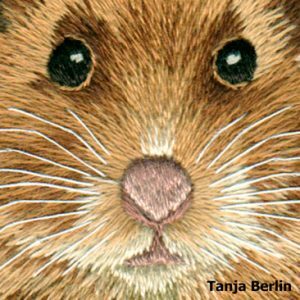 The Field Mouse is worked in needle painting also known as thread painting and long and short stitch. This is the most realistic form of surface embroidery which is worked in staggered straight stitches in a single strand of embroidery thread on a closely woven fabric, blending rows of colour to create a very realistic embroidery. 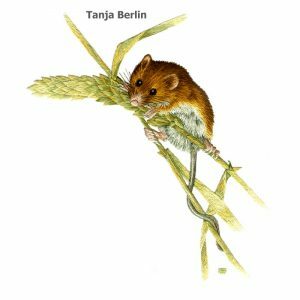 The sheen of the threads adds to the soft and life like appearance of the fur. 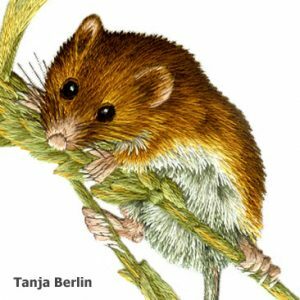 The Field Mouse is an advanced design, please visit the Needle Painting Information page for more information on needle painting and rating of the designs from easy to hard. 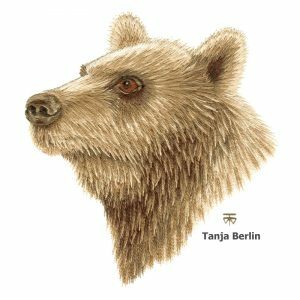 The Grizzly Bear is an intermediate design, please visit the Needle Painting Information page for more information on needle painting and rating of the designs from easy to hard. 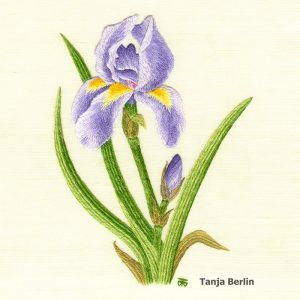 The Iris is worked in needle painting also known as thread painting and long and short stitch. 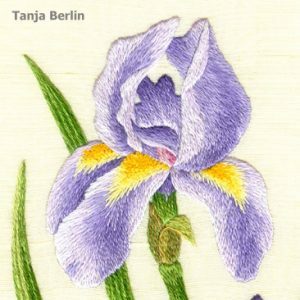 The Iris is an intermediate design, please visit the Needle Painting Information page for more information on needle painting and rating of the designs from easy to hard. 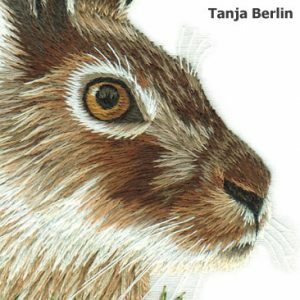 The Jack Rabbit is worked in needle painting also known as thread painting and long and short stitch. 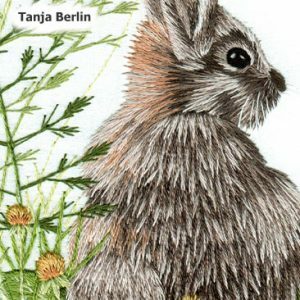 The Jack Rabbit is an advanced design, please visit the Needle Painting Information page for more information on needle painting and rating of the designs from easy to hard. 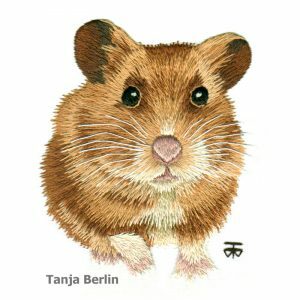 Jimmy the Hamster is a Level 3: Advanced of my Further Education designs. Jimmy the Hamster is my sisters hamster and I stitched him for my sisters birthday. I took photos of each stage of the embroidery as I stitched him. 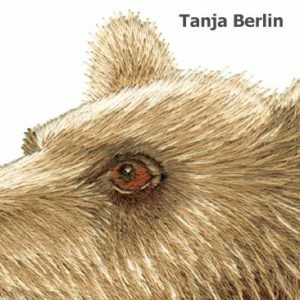 This is a great design to see how I work a commission needle painting from beginning to end. The embroidery is small and precise and worked in long and short stitch and some satin stitch. 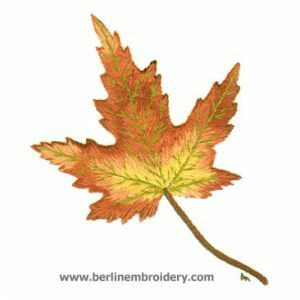 The Maple Leaf is worked in needle painting also known as thread painting and long and short stitch. This is the most realistic form of surface embroidery which is worked in staggered straight stitches in a single strand of embroidery thread on a closely woven fabric, blending rows of colour to create a very realistic embroidery. The sheen of the threads adds to the soft effect of the leaf. 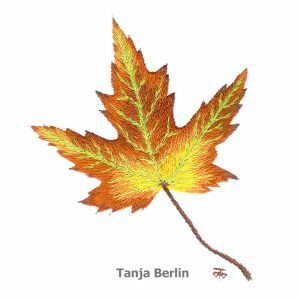 The Maple Leaf is a beginners design, please visit the Needle Painting Information page for more information on needle painting and rating of the designs from easy to hard. 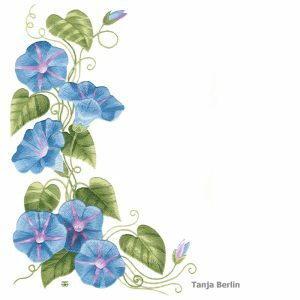 The Morning Glories is a Level 3: Advanced of my Further Education kits in which you have the option of purchasing the 3 PDF files with colour work-in-progress pictures of the entire stitching process on my morning glories that I provide when I run my on-line classes. 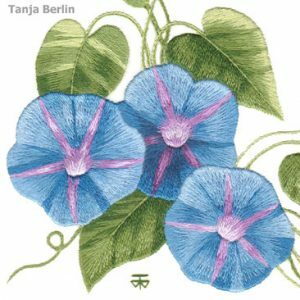 The Morning Glories is worked in needle painting also known as thread painting and long and short stitch. 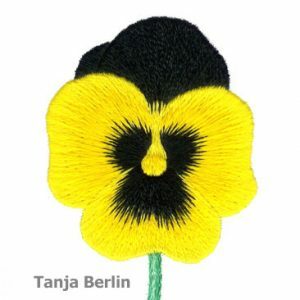 This is the most realistic form of surface embroidery which is worked in staggered straight stitches in a single strand of embroidery thread on a closely woven fabric, blending rows of colour to create a very realistic embroidery. The sheen of the threads adds to the soft effect of the petals. 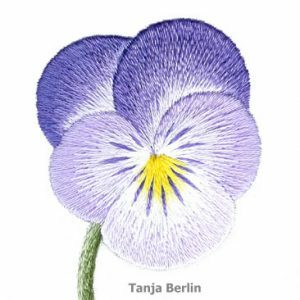 The Purple Icicle Pansy is a Level 1: Beginners of my Further Education kits in which you have the option of purchasing the 3 PDF files with colour work-in-progress pictures of the entire stitching process on my pansy that I provide when I run my on-line classes. 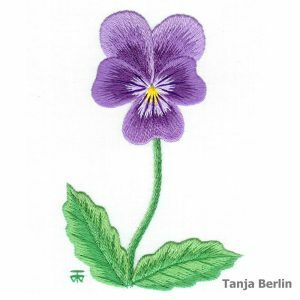 The Purple Icicle Pansy is worked in needle painting also known as thread painting and long and short stitch. This is the most realistic form of surface embroidery which is worked in staggered straight stitches in a single strand of embroidery thread on a closely woven fabric, blending rows of colour to create a very realistic embroidery. The sheen of the threads adds to the soft effect of the petals. 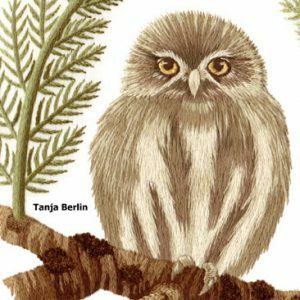 The Pygmy Owl is worked in needle painting also known as thread painting and long and short stitch. This is the most realistic form of surface embroidery which is worked in staggered straight stitches in a single strand of embroidery thread on a closely woven fabric, blending rows of colour to create a very realistic embroidery. The sheen of the threads adds to the soft and life like appearance of the bird. 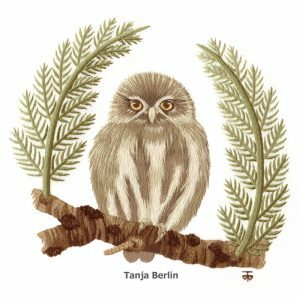 The Pygmy Owl is an intermediate – advanced design, please visit the Needle Painting Information page for more information on needle painting and rating of the designs from easy to hard. 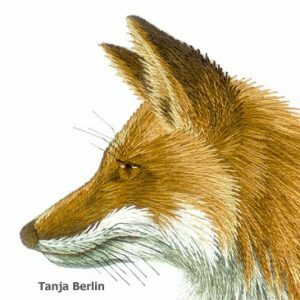 The Red Fox is a Level 2: Intermediate of my Further Education kits in which you have the option of purchasing the 3 PDF files with colour work-in-progress pictures of the entire stitching process on my fox that I provide when I run my on-line classes. 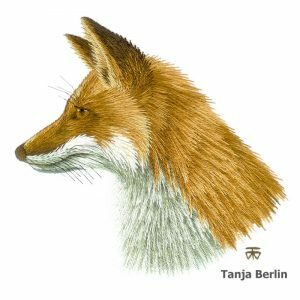 The Red Fox is worked in needle painting also known as thread painting and long and short stitch. This is the most realistic form of surface embroidery which is worked in staggered straight stitches in a single strand of embroidery thread on a closely woven fabric, blending rows of colour to create a very realistic embroidery. The sheen of the threads adds to the soft and life like effect of the fur. The Red Poll is worked in needle painting also known as thread painting and long and short stitch. 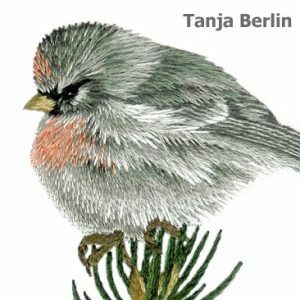 The Red Poll is an intermediate design, please visit the Needle Painting Information page for more information on needle painting and rating of the designs from easy to hard. 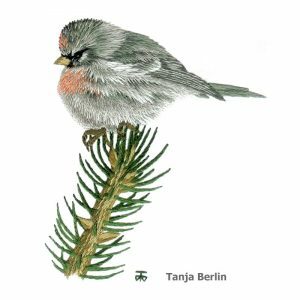 The Robin in Grass is worked in needle painting also known as thread painting and long and short stitch. 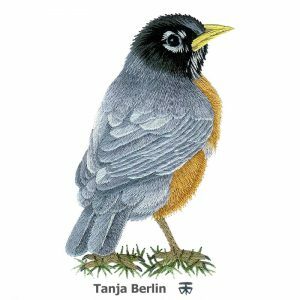 The Robin is an intermediate design, please visit the Needle Painting Information page for more information on needle painting and rating of the designs from easy to hard. 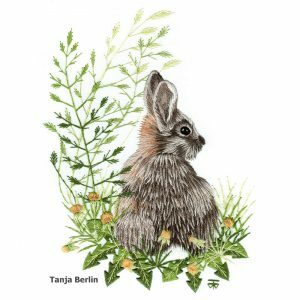 The Wild Rabbit is worked in needle painting also known as thread painting and long and short stitch. 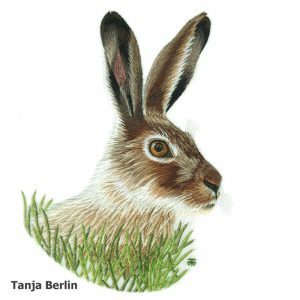 The Wild Rabbit is an intermediate – advanced design, please visit the Needle Painting Information page for more information on needle painting and rating of the designs from easy to hard. 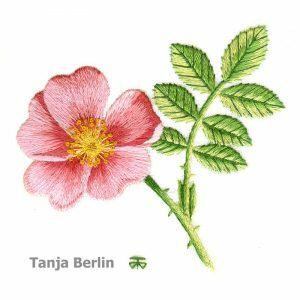 The Wild Rose is worked in needle painting also known as thread painting and long and short stitch. 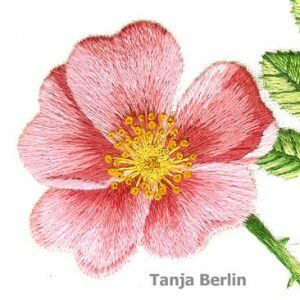 The Wild Rose is a beginners design, please visit the Needle Painting Information page for more information on needle painting and rating of the designs from easy to hard.